A fire crew shows up to assess the situation at the game feeder. They find two game cameras and one game feeder. The feeder is high in the air and pretty clear of any bush that might burn it in a fire. The crew removes one camera, but the other is in a steel bear case and is bolted to the tree and locked. So it can't be removed with out prying it off of the tree. Nope! working it back and forth will not get it off. Its a shame the NPS did not give enough notice they were going to do the burn. I was at camp the weekend before and if that had let me know in time, I would have removed the camera. The crew doing the actual burn shows up in the afternoon the next day and prepares for the burn by removing brush. There are several videos of them doing this, but one will give you the idea of what they did. They also checked out the camera in the steel bear camera box several times. Nope, it is not coming off. Ok, time to light the match. Well, the drip torch anyway. Starting at the far end and working up wind and they toward the camera, the protective burn begins. 2/8/2017 Its getting Hot over here! It seems they may have mis-judged how much clearing of brush was needed. Soon the flames are licking at the steel bear case. The camera just kept on recording. There were a couple of videos of this, but you get the picture with one. (Well, the video camera got the pictures for you to see). Now here is a guy whom is not too happy. Actually seems pretty disgusted. He is looking at a camera that looks pretty melted and ruined. I'm sure he thought he had better protected it then that and was not happy that it didn't work out that way. Sure likes to slap that lock around, but too late to remove it now. Surprise, it is still working! So now it is time to give an explanation to the fire boss and document the situation. I'm sure she does not think the camera is still working. Probably would not have given such a close-up view. Take pictures, put it in the report. Prepare for an un-happy land owner. I can just imagine what they are thinking. This is the camera, out of the steel bear box. If all I could see was the melted parts, (the rest was hidden from view in the bear case), I too would think it was ruined. If this camera was a cat and had nine lives, it would have just used up its eighth life. This camera has been chewed on by bears several times, which is why it is in a steel bear case. 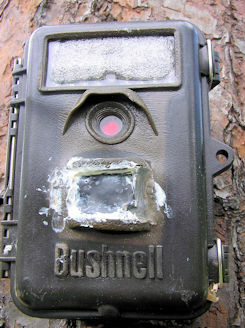 Bushnell has in the past, sent free replacement parts to fix it, including the plastic electronic trigger cover that is melted. JB weld has been used to seal up the teeth holes that are in it The led lights now are heat frosted, so the camera does not work as good at night now. It still takes pretty good daytime videos and pictures though. I have replaced it with a more modern Bushnell camera, with higher video resolution. The melted camera will be used at another location in the future. Here it is three days latter. From the smoke, it appears that the 14,000 acre burn has been started. Not much food to eat when you burn 14,000 acres at a time in the swamp. So the animals congregate at the game feeder for something to eat. As you can see the camera is still working, just not a pretty as it once was. 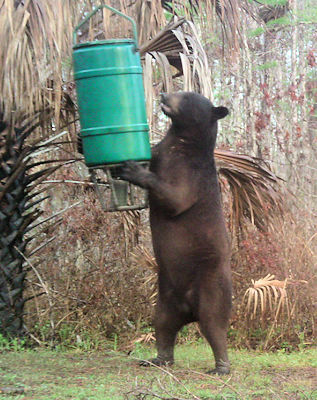 The feeder that was not affected by the fire, was ripped down by the bear in the picture, about 30 days after the prescribed burn. It gets pretty hungry when the NPS takes away 23 square miles of food for a prescribed burn. The camera showed that this desperately hungry bear worked for two days to break the 1/2" lag bolt holding up the feeder, so it could get something to eat. I replaced the feeder also. He ruined the plastic drum and the mechanism.